In my first post in this 6-part series, I covered online courses that will help you achieve six figures this year. You can’t tell me that kind of income wouldn’t take some stress out of your life. In the first post in this series I also talked about the importance of networking online and in the real world. Face it. To succeed in Real Estate Investing you’re going to have to speak face to face and over the phone with investors, sellers and buyers! You can’t avoid it. If you didn’t read the first post yet, go back and read it now. In this blog post — #2 in my 6-part series – I give you more ways to train your brain for success as an entrepreneur. There are lots of resources available to you online to help you get there. Some resources are free; some cost a little; some are higher priced, but worth every dollar to get the information and mindset adjustment required for you to create the success you desire! Podcasts – I’m a big fan of listening to podcasts, because you can choose the type of information you want to hear and you’ll always learn a lot from the guests. My podcast is but one in a vast sea of business, real estate investing, cashflow creation, entrepreneurial and getting-out-of-the-rat-race podcasts you can find in iTunes. Do some exploration. Pick your favorites. Be sure to rate them and leave a written review. That lets the podcast hosts know how they’re doing and if they need to adjust their approach. Another great thing about listening to podcasts is that you’re getting the information while doing other things. Stick your ear buds in and head out to put marketing cards on cars. Television – You may not consider this as an “online” resource, but if you also consider how many people watch television today, you’ll quickly see you need to reconsider! Television brings us the news, great human interest stories, inspirational bits and so many educational opportunities in the form of documentaries and true-life shows that you would be remiss not to find a few to watch! When you’re watching the news, keep an eye out for trends. Even sit-coms will give you clues to what’s going on in your market. YouTube – An estimated 300 HOURS of video are uploaded to YouTube EVERY MINUTE. That’s an amazing amount of information and education for the taking every second, every minute, every hour of the day. You’d never get through it all! Of course, watching the occasional cat video isn’t going to hurt you and can give you a well-deserved brain break (or it might break your brain if you watch too much), but it’s best to be on YouTube for a reason… education! Plus, you can find lots of full-length movies, documentaries and missed episodes of your favorite TV shows on YouTube… not to mention all the made-for-YouTube shows that keep being released. Forums – I have no statistics on the number of informational online forums there might be, but my guess is too many to count. Find a handful where you get a high level of interaction and answers, then stick with them. Watch out for blog bullies. Keep it clean and professional. Don’t hang out for hours. Once you find a few great forums, you’ll have places to go for quick info and answers. You’ll get to know other users and have some fun, too. Plus, you can solve some problems of other forum-goers while you’re there. Information-sharing is the whole point of forums. Pay-per-participation webinars – While you can find plenty of free webinars to attend on an astounding array of topics, there are also a number of low-cost webinars, which means you’re going to get a little more information and more opportunities to sign up for future low-cost webinars hosted by the same group(s). The great thing about webinars is that it’s the next best thing to being in a literal room with other knowledge seekers! Crash courses – Sometimes you don’t want to pay for a full course. Either it doesn’t fit your budget at the moment or you don’t want to fully commit to a full-blown course that would take weeks to complete. Why not try a Crash Course or two… or three? That way you get the meat, though just like when you’re at a restaurant the full dinner is a whole lot better! Mastermind groups – A fantastic way to cut your learning curve way down is to participate in mastermind groups where you get to interact directly with a mentor and share ideas with likeminded individuals. We always have a great time in our mastermind groups, and participants learn a great deal of life-altering information. The exciting part is to watch them, week after week, put their new knowledge to use. The earmark of a great mastermind is when you are given homework assignments and expected to report your findings. Otherwise it’s just theory. You need hands-on experience. Then it will really stick in your head and you’ll get further faster. Private coaching/mentorships – If you prefer a one-on-one training experience and you have the budget for it, you can benefit greatly from private coaching. When you find a mentor from whom you wish to learn for a given period of time, and that person offers private coaching and is open to being your mentor… go for it! However, this is typically a high-dollar arrangement. But think about it… If you expect the expert to share with you all he/she knows, that is worth the price tag attached. You can go on and do exactly as that expert has done! You can accomplish more even faster and you have very personal access to your mentor! While part of this experience happens in the real world, a lot of it will be distance training, including online interactivity with your mentor. In the world of real estate investing, you’re likely going to want to call your mentor/coach from the field to get his/her input on deals. That should come with the package! Here’s the deal. There is an endless supply of online resources and educational opportunities. Network yourself in with others who discover the same sites and resources you do. You won’t just get a great education, but you’ll also stay more motivated and inspired to do your best. Plus, you’ll be one of the best informed in your network. You know what that means? He who educates also dominates. The only way to get educated and stay informed so you can dominate your market is to continually feed your brain. With that feeding comes a massive mindset shift, which is also necessary for success! Once you are a member of different networks, memberships and groups, you’ll have one final online educational opportunity… and it is ongoing. You’ll receive content that is dripped into your email box either by links or direct drop. There’s a reason to read your emails. You might miss something important, like a new bit of knowledge that you need to help you in your business… or an invitation to a small, private learning experience. That said, whether you attend online or in-the-real-room training, you need to try what the instructors and presenters tell you to do IMMEDIATELY. It is easier to do if you’re taking an online course or watching how-to video training in the comfort of your home than it is to leave a seminar to try out tactics. You can, however, step out of a room at break or even during a presentation to make calls. That’s what I did. I talk about that in my training and in my book! 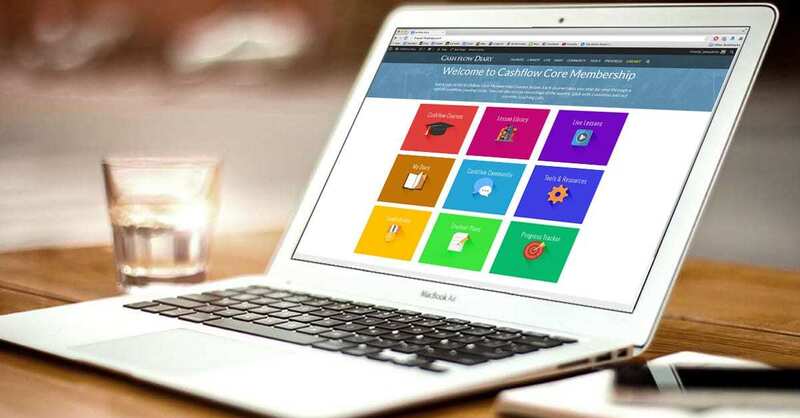 You’ll find plenty of online training in all forms inside our Cashflow CORE Membership. Log in from anywhere at any time for 24/7, on-demand access to all the Cashflow CORE Courses, so you can learn how to wholesale properties, invest in multi-family properties, raise capital for all your deals (so you don’t use a penny of your own), ways to network that will put you in front of the right people, the exact words to use to get conversations started and keep them going, the precise steps to take and how to explain deal structures to investors, and so much more that you won’t believe your eyes. You have immediate online access to more than 200 HOURS of video training and related content! Watch replays of our LIVE events (we record most of them) and all of our recorded LIVE Q & A with J. episodes. Get the benefit of video lessons we don’t promote very often, like training on how to do tax lien deals and other types of investing. You could spend countless hours in the Lesson Library alone! I realize I’m throwing a lot of information at you. That’s why I’ve broken this into a 6-part blog series. Be sure to keep reading and take action. Keep looking for new learning opportunities online and promise to never stop learning!